There are hundreds of images of the Buddha at Wat Pho. In fact, King Rama III saw to the restoration of Wat Pho for the purpose of showing the images of Buddha in various positions according to Buddhist beliefs. This restoration and expansion of the temple started in 1832 and lasted for 16 years. 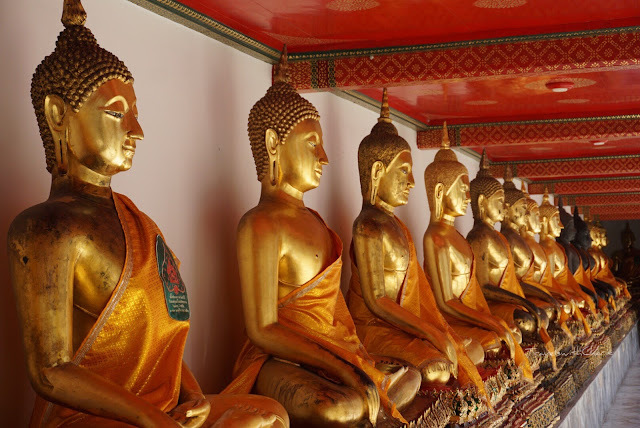 Images of the seated Buddha, the standing Buddha, the meditating Buddha and the reclining Buddha are found in Wat Pho. Here are some of the images of the standing Buddha. Buddha Maravichai The Buddha obtained enlightenment after meditating for 49 days under the bodhi tree. He found the answer to the causes of suffering which are greed, selfishness and ignorance. The Noble Eightfold Path preached by Buddha is the way to end suffering. These are: Right Understanding, Right Thought, Right Speech, Right Action, Right Livelihood, Right Effort, Right Mindfulness and Right Concentration.